DANIEL STURRIDGE SCORED twice as Liverpool strolled into the League Cup third round with a 5-0 win at Burton Albion, while Chelsea edged third-tier Bristol Rovers 3-2. Divock Origi, Roberto Firmino and Sturridge all scored as Liverpool, last season’s beaten finalists, crushed Championship side Burton, who are managed by ex-Liverpool midfielder Nigel Clough. Michy Batshuayi marked his full Chelsea debut with a brace against Bristol Rovers, while Victor Moses was also on target as manager Antonio Conte enjoyed a third straight competitive win. Premier League sides Crystal Palace, Everton, Hull City, Swansea City and Stoke City also went through, Peter Crouch scoring a hat-trick for Stoke in a 4-0 win at Stevenage. 3 - Peter Crouch has scored his first hat-trick since August 2010 (Spurs v Young Boys). Vintage. But Watford and West Bromwich Albion were both taken to extra time by third-tier opposition, the former drawing 1-1 at home to Gillingham, the latter held 2-2 at Northampton Town. Liverpool manager Jurgen Klopp handed a debut to Cameroonian centre-back Joel Matip and welcomed back Senegalese winger Sadio Mane following a shoulder injury at Burton’s Pirelli Stadium. Mane teed up Origi to break the deadlock with a clever back-heel in the 15th minute before Nathaniel Clyne crossed for Firmino to head in the visitors’ second goal. A Tom Naylor own goal just after the hour made it 3-0 and Sturridge came off the bench to complete the rout with a late brace, tapping in James Milner’s cross and slamming home from Mane’s pass. At Stamford Bridge, Batshuayi put Chelsea ahead in the 29th minute by sweeping in Nemanja Matic’s cross and two minutes later Pedro Rodriguez set up Moses for a tap-in. Batshuayi claimed a second from Ruben Loftus-Cheek’s cross, but Bristol Rovers scored either side through Peter Hartley and Ellis Harrison to keep Conte’s men on their toes until the final whistle. Where has it all gone wrong for Everton’s Irish contingent? Email “Sturridge grabs brace as Liverpool run riot while new Chelsea signing impresses in nervy win ”. 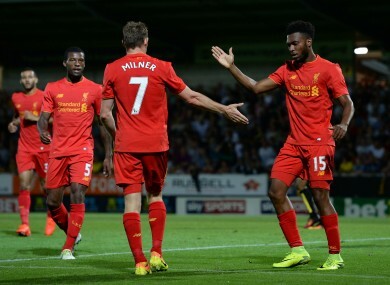 Feedback on “Sturridge grabs brace as Liverpool run riot while new Chelsea signing impresses in nervy win ”.